The personal trainer of FitBody Personal Training LLC, Carolyn Grashof, offers classes that require no yearly commitment. Carolyn recently announced a new pricing module for these classes. Carolyn recently announced a new pricing module for these classes. FitBody personal Training LLC announces a new pricing module for boot camp classes. Specific session dates are being eliminated and boot camp classes will run continuously throughout the year. Participants can now pay for a single class, unlimited classes or a punch card. For more information on pricing go to http://www.fitbodyforeverybody.com or email carolyn(at)fitbodyforeverybody.com. The personal training classes, offered by Carolyn Grashof, give participants a fun way to take workouts away from the gym. The classes energizes the body by giving it a challenging workout. 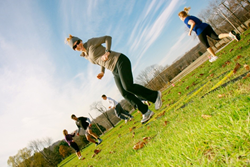 The indoor boot camp classes are held on Monday and Thursday nights and Saturday and Sunday mornings. Requiring no yearly commitment, participants can sign up any time. The location of the fun and energetic personal training classes is Phoenixville, PA. Monday, Saturday and Sunday classes are located at the Civic Center on 123 Main Street in Phoenixville, PA 19460. Thursday class indoor location is at Phoenix Hook Hose and Ladder Co., on 177 Church Street in Phoenixville, PA 19460. FitBody Personal Training LLC was started by Carolyn Grashof who has been a group fitness instructor since 1997 and has been practicing personal training since 2002. Carolyn is a highly energetic person and motives people to get in shape. She specializes in Pilates, cardio kickboxing, spinning, athletic step, pool fitness, interval training, boot camp classes to name a few. Her expertise also includes posture, strength, cardio conditioning, and flexibility programs to suit her clients’ body and goals.